Brookwater Fairways Stage 2 - Pensar. The Infrastructure People. Nestled in amongst the Greg Norman designed championship golf course at Brookwater, you will find The Address Stage 1. 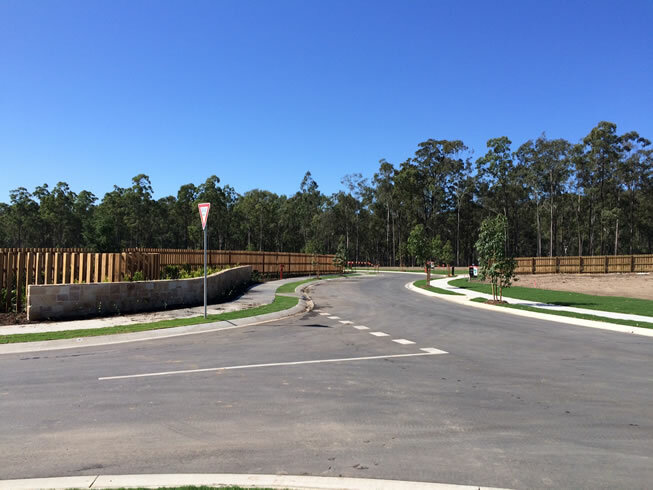 The Address Stage 1 is a 37 lot subdivision within the master-planned community of Brookwater. Early removal of live sewer to facilitate the installation of a new line to service upstream properties. Early and frequent communication and interaction with local authorities (ICC & QUU) to allow early sewer works to occur. Design and construct of over 1,100m2 of masonry brick wall. Construction of 330m2 of detailed feature cobblestone entry, including the import of cobbles from China. Over 4,000m2 of pavement construction. Design and construct the Elster water meter system which displays comprehensive water usage of each lot at the entrance of the estate (involving approx. 7km of underground cabling). Early access granted for landscaping contractor to allow works to be fast tracked. Over 3.5km of underground services installed.